The course comprises a series of lectures by Shaykh Yahya Rhodus, Shaykh Faraz Rabbani, and Ustadh Amjad Tarsin. It considers the appropriate Islamic responses to the tribulations faced by the Umma in the current climate of Islamophobia and hatred of Muslims. 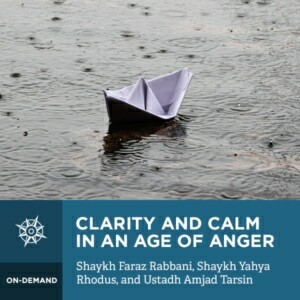 The scholars argue that the key to developing these responses is to repress and re-channel one’s anger and to nurture prophetic character traits, such as patience, forbearance, serenity, and tranquility. Armed with these traits, a believer must respond to bad treatment by forgiving the person, and by calling them to Allah. All Muslims have the responsibility of having principled engagement with those around them. We should do everything solely for the sake of Allah, repress our anger towards those who wrong us, and show excellence to them. We are obligated to be content with everything because it is from Allah. We should avoid worry because it leads to anger. Instead, we should show concern about what should be done to deal with a problem. Our faith transforms us from having an animal nature to being a human being with traits resembling those of the angels. In particular, we should show mercy to others. We must be patient, forbearing, and humble, and pray for the wrongdoers. We must be people of deliberation and avoid haste because it is from the shaytan. We must seek out righteous people and be in their company. We must be people of God-consciousness, seeking to always do what is best. Allah Most High, says that evil and good are not equal. If someone is bad to you, treat them as if they’re beloved to you. But Allah says that no one can attain this except one to whom He gives a great portion.